Are you in the market for a classic automobile once owned by one of the biggest Hollywood legends ever? Well you’re in luck, because Clark Gable’s 1955 Mercedes-Benz 300SL Gullwing Coupe is headed to the auction block courtesy of Barrett-Jackson auction house. Originally purchased for $7,295 at Mercedes-Benz of Hollywood, Gable’s former vehicle touts a silver exterior, 6-cylinder 3.0-liter engine and a four speed manual transmission. After the actor’s death in 1960, the ownership passed to cartoonist Harry Haeigen, who was also Gable’s publicist. The title then passed to Charles Wood, owner of Grand Amusement Park in 1975. Since then, the vehicle has once again transferred ownership and is now up for grabs. The car has been completely restored to the tune of $200,000 in order to duplicate how the vehicle was in Gable’s lifetime. The car even endured extensive testing to ensure that it handles and performs just as it did in 1955. The restored Gullwing Coupe was featured in the May/June 2006 edition of Motor Trend Classic magazine. Aside from being fully restored, the famous actor’s former ride comes with registration cards featuring Gable’s signature, along with his fifth wife Kathleen “Kay” Sprecker. Not to mention, the winning bidder will also get signed service orders from Mercedes-Benz of Hollywood for a lube/oil change for $4.00 and parts for $10.83. Another one of Gable’s cars, a 1935 Duesenberg, reached the auction block in August. The vehicle is considered one of the rarest celebrity-owned vehicles. In fact it's one of just 10 JN models built and one of only four examples of a convertible coupe. Bidding on the ultra-rare vehicle reached $6.4 million, but failed to sell because the owner’s reserve price was not met. In 2009, Gable’s 1938 Packard Eight Convertible Victoria sold at auction for $282,000. According to Hollywood legend, Gable sold the vehicle due to the swarms of women that would chase after it. The actor would later opt for a less ostentatious black coupe. Known as an avid car collector, Gable was recently featured in Lincoln Motor Company’s new commercial, which introduced the all-new 2013 Lincoln MKZ and re-introduced the Lincoln brand. The Oscar winning actor was once the proud owner of a 1946 Lincoln Continental. Considered the seventh greatest male star of all time by the American Film Institute, Gable was nominated for three Oscars during his career, winning once in 1934 for It Happened One Night. Gable’s impressive resume includes roles in Gone With the Wind, Mutiny on the Bounty and The Misfits, which was his final role. 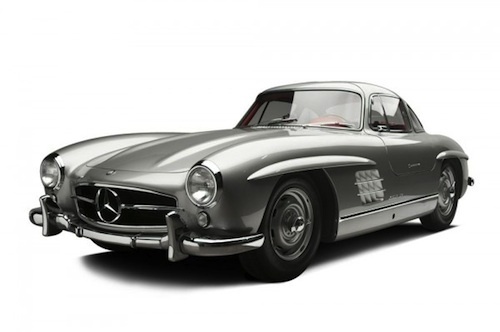 Gable’s 1955 Mercedes-Benz 300SL Gullwing Coupe will be up for auction at the upcoming Barrett-Jackson, which takes place at Westworld of Scottsdale in Scottsdale, Arizona from Jan. 13 to 20. Pool bet anyone? I say $650 to 950K. Yeah, it's not a racer but provenance is huge in this case. I drove one one day and it was an amazing drive. You could feel anything on the road. By the way, it was the very first direct injection car, and that was in the 50s!